As is often the case, our vehicle specific diesel particulate filter FAQs for help are published after a heart felt plea for information and a shoulder to cry on. This time it’s a close friend who has been gifted a post Christmas present in the form of a dreaded DPF dash light on his 58 (2011) plate Volvo S40 1.6 diesel (Eco). Considering his sub 10 mile commute to the office we’re not entirely surprised that its gone in such a short time. I was rather shocked to see how Volvo deal with DPF cleans in their smaller 2.0 and 1.6 litre diesel engines and rather saddened by what I have discovered. They are destined to fail by design and to be replaced as a “service” item at just 75,000 miles. My expert “googling” suggests that a bill of £700 to £1000 will be heading your way for the job. This rather shocking shelf life is due to the additive which is automatically added to the fuel tank from a special tank located underneath it. The additive, namely Eolys is a cerium/iron based solution which is designed to assist in DPF regenerative during normal driving conditions. According to Volvo the tank should be refilled every 36k miles and if for any reason it’s empty the car will not attempt any kind of DPF regeneration. Much like other DPF regeneration there are specific conditions which must be met, meaning those motorists who commute short journeys are already doomed. This is designed to help ensure a successful DPF regeneration however the Eolys additive leaves a small ash residue. Unlike the soot build up within a DPF, ash can not be burnt off, so when its full of ash the DPF will need to be replaced. The additive itself is also part of your serviceable items, meaning you’ll be charged anything up to £100 for your additive tank to be topped up. Diesel cars may be equipped with a particle filter, which results in more efficient emission control. The particles in the exhaust gases are collected in the filter during normal driving. So called “regeneration” is started in order to burn away the particles and empty the filter. This requires the engine to have reached normal operating temperature. Regeneration of the filter takes place automatically at an interval of approximately 300 – 900 km depending on driving conditions. Regeneration normally takes 10 – 20 minutes. It may take a little longer at a low average speed. Fuel consumption may increase slightly during regeneration. 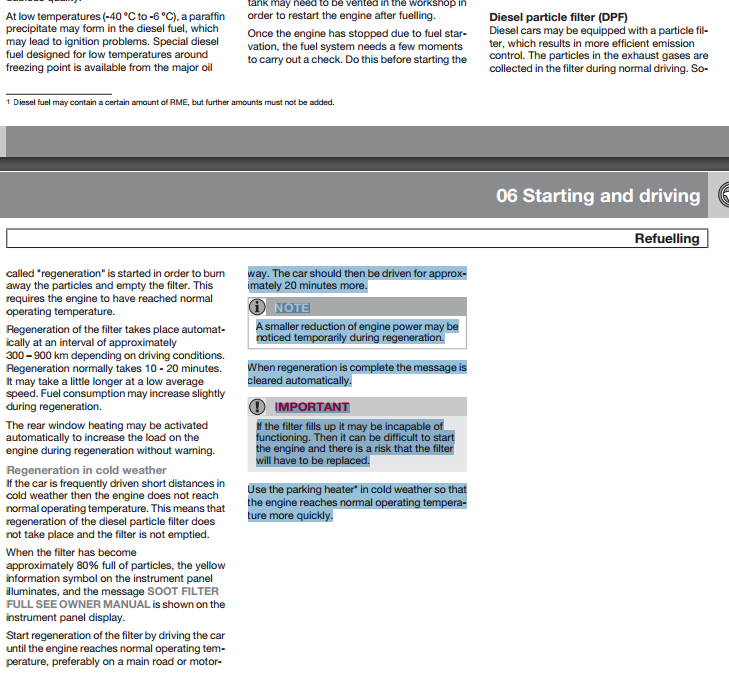 The rear window heating may be activated automatically to increase the load on the engine during regeneration without warning. If the car is frequently driven short distances in cold weather then the engine does not reach normal operating temperature. This means that regeneration of the diesel particle filter does not take place and the filter is not emptied. When the filter has become approximately 80% full of particles, the yellow information symbol on the instrument panel illuminates, and the message SOOT FILTER FULL SEE OWNER MANUAL is shown on the instrument panel display. Start regeneration of the filter by driving the car until the engine reaches normal operating temperature, preferably on a main road or motor way. The car should then be driven for approximately 20 minutes more. NOTE A smaller reduction of engine power may be noticed temporarily during regeneration. When regeneration is complete the message is cleared automatically. IMPORTANT If the filter fills up it may be incapable of functioning. Then it can be difficult to start the engine and there is a risk that the filter will have to be replaced. Use the parking heater* in cold weather so that the engine reaches normal operating temperature more quickly. If you’ve had any experience with DPF diesel particulate filters in your Volvo then please comment below. You just might be able to help a fellow Volvo driver dodge the DPF bullet. I have a 2016 XC90 with 36,000 miles and have just been told that the DPF needs replaced as does all of the connecting pipes as the car went into Limp mode. once replace is this likely to be a re-occuring problem? That seems very low mileage for a dpf replacement. I would seek a second opinion as this will be very costly. Is the unit itself defective or full? If it’s full at that mileage it could be an issue with the EGR valve. 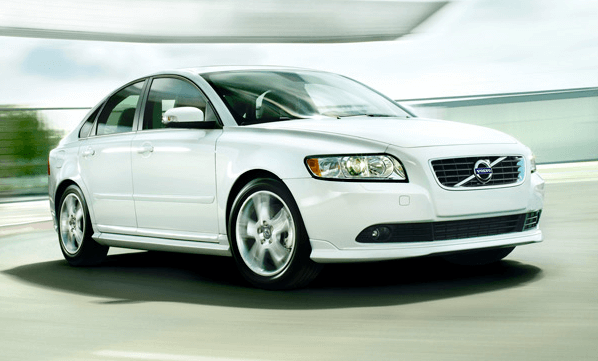 The car is also still under warranty, Volvo might even offer you a dealer contribution due to the age and mileage of your car. Let us know how you get on.